What are the best patio surfaces if you are living in Charlotte, NC? It depends on what you will be using the patio for! The most traditional surface is concrete. It is still the standard for track builders to provide a small “slab” outside the rear exit door of a home. The advantages are lower cost, low maintenance, and ease of installation. The disadvantages are primarily the propensity to crack and poor aesthetics. Stamped concrete improves the aesthetics, raises the cost, but does not address the cracking. Flagstone is a popular surface for it’s aesthetics and is often found in high end neighborhoods. The advantages are the beauty and low maintenance, the disadvantages are the very high cost and will still crack over time. Paver patios are the most popular surface in Charlotte. They combine the reasonable price point with good aesthetics. People believe that weeds can grow up in between the pavers (which normally happens only when an amateur constructs the patio and does not add enough base or seeds fall from above and grow in the poly sand). They come in a variety of colors and sizes. Finally, Travertine patios have been the fastest growing segment of the market here in Charlotte. They have tighter lines than traditional paves with less chance of weeds growing in between in the sand. In addition, the look resembles a tile and in fact can be purchased as a tile for applications directly over concrete on decks. The price point is slightly higher than pavers. Hardscape designs can be defined by a combination of products being incorporated into a project. 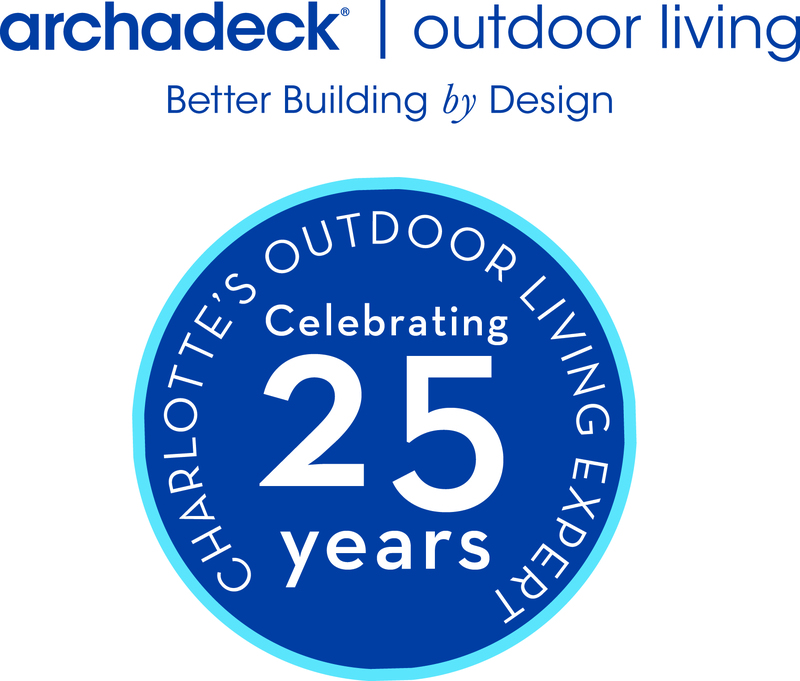 We have grown into a full hardscape design build firm at Archadeck of Charlotte. The origins of hardscapes was really referring to any retaining wall work and patio work. Today we lump the term “hardscapes” with almost any hard surface like outdoor kitchens, outdoor fireplaces, fire pits, and water features. 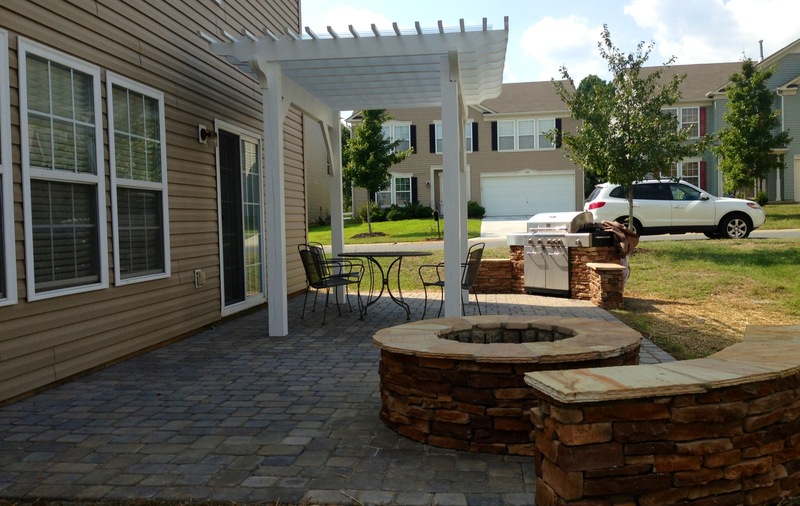 The market has made a major shift towards more and more hardscape designs in the Carolinas. The combination of substrates such as stacked stone, pavers, and block are a very common theme today. To see a wide variety of hardscape designs, you can visit archadeckofcharlotte.com or go to the show room in Charlotte at 2225 Coronation Blvd. Charlotte, NC 28227. How do I expand my patio? What is the current slope of the patio? It is most likely sloped away from the house to allow for proper drainage. If you are expanding your patio further away from the house, you will have to grade appropriately so you do not create an area where water will sit due to a grade change. How is the edge of your patio finished? Is there a border around it? Are there full pieces or cut edges. There needs to be some thought as to how to properly blend in the extension so it appears to built as part of the original design. How old is the existing patio? Has the color faded or is it stained? Perhaps consider combining a different substrate rather than trying to match! To get wonderful patio design ideas, visit our paver patio photo gallery or our stone patio photo gallery. Are you thinking about adding some amenities to your patio? Take a look at our fire features photo gallery. With the explosion in the outdoor living category, there are more innovations being used for patios and porches. Over the past 10 years, the use of Travertine Tile style pavers has seen a boom! The combination of the beauty of the product and the low-maintenance have made it grow in popularity. In addition, the price of Travertine is not that much greater than a paver patio. The consistent question that arises is whether or not Travertine is slippery? The quick answer is no. This is true if you are using the Travertine stone paver (as opposed to travertine tile). In addition, so of the commercial sealers can make it more slippery. We have found it to be no more slippery that any other stone patio! To see some great patio designs, visit our stone patio photo gallery on our website. What should I expect to pay per square foot to lay pavers in Charlotte, NC? Next, the size of the patio matters when it comes to price per square foot. The larger the patio, the cost per square foot may come down due to efficiencies in labor. When you have a small patio, the same things need to happen and the labor needs to make a minimum amount to make it worthwhile. The substrate or material type also affects the price per square foot. Paver patios are made by various manufacturers with different price points from companies such as Belgard or Pavestone. The patterns may also affect labor costs. When you think about having a paver patio designed-and-build by a professional patio company, the price per square foot should come in between $14 – $25 per square foot. If you are considering adding a patio to your Charlotte-area home, give us a call for a free consultation at (704) 944 – 1350. Take a look at some great Charlotte paver patio pictures on our paver patio photo gallery. Also enjoy perusing our stone patio photo gallery. Which stone is best for my backyard patio? How do you go about selecting the best stone for your backyard patio? This blog will take you through the various options and why or why not you might select them! The basic patio started with cement. The product is relatively inexpensive (although the cost has risen over 20% the past 2 years) and can be done quickly. The key to a good concrete job is the preparation of the site, the PSI used for the concrete, the thickness of the patio base, and the finish. In addition, there needs to be an understanding of the grade of the land as well as where to strategically place the contraction joints so that the cracks that are inevitable will happen in the joints. Paver patios have gained in popularity each and every year in North Carolina and South Carolina. We see a high demand in Huntersville as well as Fort Mill. These are great in that most are moderately priced, will not crack, and come in a variety of colors. If the appropriate base is not constructed, there will be weeds that grow from beneath and if cheap sand is used, it will all wash away. Consult a professional for a long lasting paver patio. Travertine pavers are popular these days in the Ballantyne, NC as well as Waxhaw< NC areas and into south Charlotte. This substrate offers the look of tile while being much more slip resistant. They come in a variety of colors and are just slightly more expensive than pavers. If you get a professional to install French Pattern Travertine, you will love the character of the patio based on the variety of sizes. Finally, flagstone patios are the high end of the price spectrum. These are irregular shaped flat stone laid either in concrete or crushed stone and sand. They come in a variety of colors and are best known for their beautiful appearance. Call Archadeck of Charlotte to schedule your free design consultation at (704) 944-1350 or email us at charlotte@archadeck.net. Can I put pavers over my existing concrete patio? A common scenario is a home with a small concrete patio or slab that a homeowner wants to extend and add a patio. The question we get asked all of the time is can you build over the existing slab or does it need to be removed? The answer most of the time is yes that the existing slab is actually a great foundation for the new pavers. You can also incorporate Travertine or even flagstone on existing concrete.